NASA's New Horizons spacecraft has entered its last hibernation phase before its January 2019 encounter with Kuiper Belt object 2014 MU69. Mission controllers at the Johns Hopkins University Applied Physics Laboratory (APL) in Laurel, Maryland, verified that New Horizons – acting on commands uplinked to its main computer the week before – went into its hibernation mode today at 9:31 a.m. EST. With the spacecraft now about 3.8 billion miles (nearly 6.2 billion kilometers) from Earth, the radio signals carrying that confirmation message from New Horizons needed five hours and 42 minutes – traveling at the speed of light – to reach the APL mission operations center through NASA's Deep Space Network station near Madrid, Spain. This hibernation period will last until June 4, 2018. While the spacecraft hibernates the mission team will continue to plan the detailed sequences that will tell New Horizons how to make the many planned scientific observations of MU69 during its close-range pass in the days surrounding Jan. 1, 2019. After June 4 the spacecraft will stay "awake" until late 2020, long after the MU69 flyby, when all of the data from that flyby have reached Earth. Follow New Horizons' path through the Kuiper Belt at http://pluto.jhuapl.edu/Mission/Where-is-New-Horizons/index.php. A Hibernation Refresher: During hibernation mode, much of the New Horizons spacecraft is unpowered. The onboard flight computer monitors system health and broadcasts a weekly beacon-status tone back to Earth, and about once a month sends home data on spacecraft health and safety. 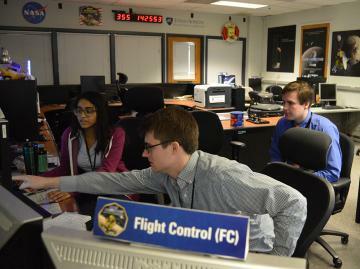 An onboard sequence sent in advance by mission controllers will eventually wake New Horizons to check out critical systems, gather new Kuiper Belt science data, and perform course corrections (if necessary).